ISTANBUL, October 2016 – Fairmont Hotels & Resorts is delighted to announce that Fairmont Quasar Istanbul, a highly anticipated addition to the city’s glittering skyline, will open its doors on 16 January 2017. Rising above the slopes of The Bosphorus, Fairmont Quasar will serve as a genuine hub for the well-travelled, uniting the sophistication of modern Istanbul with the unique lineage of its location, steeped in centuries of sacred history. Fairmont Quasar, the first hotel for Fairmont in Turkey, will be the fifth property of parent company AccorHotel’s luxury brand portfolio within Istanbul, joining sister properties Raffles Istanbul, Swissôtel The Bosphorus, Pullman Istanbul Airport and Convention Center and The Elysium Istanbul MGallery by Sofitel. AccorHotels presently has 32 hotel and resort properties across Turkey, with an additional three hotels slated for opening in Istanbul in 2017, including Galata Hotel Istanbul MGallery by Sofitel. A new icon for the vibrant Mecidiyeköy district, Fairmont Quasar sits at a crossroads in Istanbul – where eclectic neighborhood bazaars and colorful side streets meet modern shopping centers and commercial properties. Set on the site of the 1930’s Robert Mallet Stevens’ designed Art Deco liquor factory, Fairmont Quasar will blend a sense of urban culture and industrial flair with the city’s storied traditions and a strong sense of place. 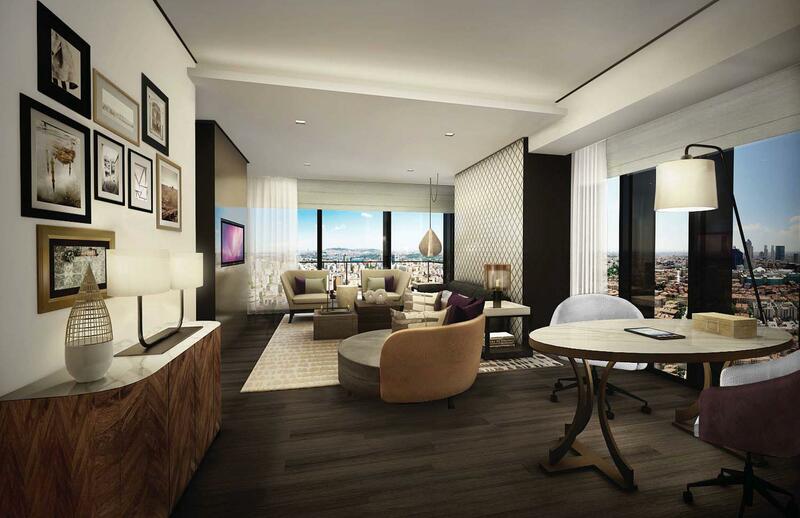 Fairmont Quasar Istanbul will provide 209 guestrooms including 25 suites. Each has a wide panoramic view overlooking either the serene Bosphorus or the city skyline. Rooms are designed to maximize comfort and technology, with stylishly industrial touches, plenty of space and natural light. The design details at Fairmont Quasar smartly mix glamour with culture. Blue leather-tufted headboards call to mind The Bosphorus; mini-bars are inspired by vintage travel trunks, leather-bound and studded; ensuite showers resemble traditional Turkish hammams. The Royal Suite is the star of accommodation, with numerous one-of-a-kind luxuries, while 40 Fairmont Gold rooms create a hotel within the hotel, where service and experience surpass all expectations. Ukiyo – Located on the terrace, with Asian-inspired cuisine and inspiring Bosphorus views – the pinnacle of summer style. Guests can relax during their stay in the Willow Stream Spa – a wonderfully serene escape from the bustle of the city. Nine treatment rooms, traditional hammam, an indoor pool, yoga room and state-of-the-art gym provide ample space to replenish the mind, body and spirit. Fairmont Fit, available to Fairmont President’s Club members, delivers Reebok fitness apparel and footwear to guestrooms upon request. The hotel offers an inspiring choice of spaces for private and business events, from a large scale launch or a society wedding in the Ballroom, to a small dinner in one of nine private rooms or high-level board meeting in one of two dedicated boardrooms. Kai Winkler joins Fairmont Quasar Istanbul as the general manager, bringing more than 20 years of luxury hospitality experience in Turkey and abroad, including most recently with Kempinski in China.